What Capability Features Come With the GMC Terrain? | Holzhauer Motors Ltd.
What Capability Features Come With the GMC Terrain? If you are in search of a small SUV, we can help at Holzhauer Motors. The GMC Terrain is a popular model at our dealership because of all that it has to offer. This SUV comes well-equipped with a number of capability features that enhance performance. The Traction Select System is a standard feature with the SUV's All-Wheel-Drive trims. This system features drive modes that include FWD, AWD, Off-Road, and available tow/haul. The Front-Wheel-Drive trims come with a Normal mode and optional snow mode and tow/haul mode. This system is capable of real-time adjustments for maximum performance. 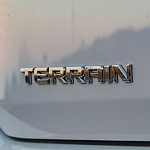 You can choose between three turbocharged engines with the Terrain. The 1.5L turbocharged gas engine is paired with a nine-speed automatic transmission and can reach 203 lb.-ft. of torque with 170 horsepower. The available 1.6L turbocharged diesel engine comes with a six-speed automatic transmission and can deliver 137 horsepower, and the available 2.0L turbocharged gas engine can reach 252 horsepower and is paired with a nine-speed automatic transmission.